The American city and the American movie industry grew up together in the early decades of the twentieth century, making film an ideal medium through which to better understand urban life. Exploiting the increasing popularity of large metropolitan cities and urban lifestyle, movies chronicled the city and the stories it generated. 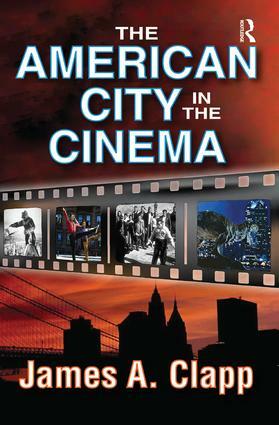 In this volume, urbanist James A. Clapp explores the reciprocal relationship between the city and the cinema within the dimensions of time and space.A variety of themes and actualizations have been repeated throughout the history of the cinema, including the roles of immigrants, women, small towns, family farms, and suburbia; and urban childhoods, family values, violent crime, politics, and dystopic futures. Clapp examines the different ways in which the city has been characterized as well as how it has been portrayed as a character itself.Some of the films discussed include Metropolis, King Kong, West Side Story, It's a Wonderful Life, American Beauty, Rebel without a Cause, American Graffiti, Blade Runner, Gangs of New York, The Untouchables, LA Confidential, Sunrise, Crash, American History X, Breakfast at Tiffany's, The Deer Hunter, and many more. This work will be enjoyed by urban specialists, moviegoers, and those interested in American, cultural, and film studies.